Whether you are an amateur entomologist or an aspiring scientist here is a project that will let you explore the world of butterflies in your backyard. Best of all is that everything you need you probably already have. If you are missing something, then a quick trip to the "Everything less than a Dollar Store" should solve your problem. 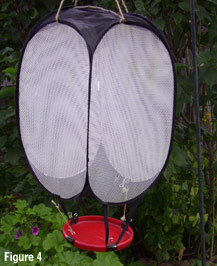 For a traditional butterfly trap, you will need a dollar store laundry hamper, a Frisbee, 6 binder clips, and about 3 feet of twine (Figure 1). The first step is to make two sets of connected binder clips by attaching them with a length of twine that will leave a span about 6 inches in between them. After you have the two sets of clips connected together place one of the clips onto the edge, or rim of the Frisbee and the other free clip onto the opposite rim/edge. So now you should have two clips attached to the Frisbee at opposite sides (Figure 2). Next pop the laundry hamper open and place it upside down so that the opening is facing upwards. 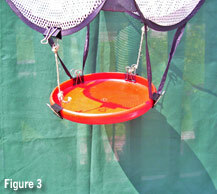 While holding the Frisbee above the opening of the upside down hamper fasten the dangling binder clips onto the top edge that makes up the opening the hamper but not the sides with handles. Now your Frisbee will be attached to the upper edge of the hamper by the two clips that were just hanging loose. Take the two free binder clips (the one not fastened to any twine) and place them on to the handles of the hamper; let them dangle for now. Take one of the clips that you had placed on the hamper's handle and attach it to one of the open areas of the Frisbee; repeat this with the other clip on the opposite side. Now your Frisbee will be connected to your laundry hamper at 4 points that are equally spaced apart. You'll know you did it right when you turn your trap upside down and it looks like Figure 3. 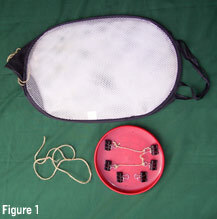 The finished trap is depicted in Figure 4. Put some butterfly bait in the Frisbee. Butterflies will smell the bait and land on it to drink. Then when you approach the trap the startled butterflies will fly up into the inside top of the trap and become confused allowing you an opportunity to reach inside grab them with your fingers. Have some fun and experiment with various baits. Does it work? That all depends on where and when you use it. Will it keep your kids busy and outside getting some exercise? You Bet!